Below are the venues that participated in First Friday: Oceanside Art Walk for December 2016. Do your holiday shopping with over a dozen local artists! Ugly Sweater Christmas Party - wear your ugly sweater!! Below are the venues that participated in First Friday: Oceanside Art Walk for October 2016. Below are the venues that participated in First Friday: Oceanside Art Walk for September 2016. Below are the venues that participated in First Friday: Oceanside Art Walk for August 2016. Below are the venues that participated in First Friday: Oceanside Art Walk for July 2016.
one year anniversary of Whitlock in downtown Oceanside - Fun! Games! Raffles! Giveaways! FoodiesBySonia - It's a fun sweet night! With cupcakes, cake pops, rum balls and more! 1960's crafts to celebrate our Club O event that will be on Saturday, April 2! Make a macrame choker or a love bead necklace or color in some 60s themed coloring books. It will be groovy! projections of thousands of murals! Below are the venues that participated in First Friday: Oceanside Art Walk for March 2016 - Spring Forward in Oceanside! Celebrate Dr Seuss! Join OMA as we celebrate Dr. Seuss's March 2 birthday with official activities from seussville.com! Scott Paulson will be there to help out. The serene stylings of PCH Jazz @ Muramid Museum and Art Center. Artist at Work - Sheila Montez @ Muramid Museum and Art Center. Participate in creating a mural @ Muramid Museum and Art Center. Quite a crowd enjoying music by PCH Jazz, Shiela Montez's Gordgeous Gourds, painting a mural for the UN Women effort, and of course all those wonderful murals! @ Muramid Museum and Art Center. Maria Elena Cruz with her spectacular works @ Century 21 Oceanside. Small Town Heroes rockin it @ MainStreet Oceanside. Amazing photography by Todd Hummel Photography @ MainStreet Oceanside. Huge Thank You to our major sponsor Mossy BMW of Vista!! Below are the venues that participated in First Friday: Oceanside Art Walk for February 2016 - Celebrate Love as part of the inaugural Oceanside Valentine's Week! Yael and Vlad from Big Boss Bubeleh making beautiful music @ The Brooks Theater. The intriguing works of Cici Porter Groupé @ RE/MAX Seagaze Realty. Sneak peek at the Muramid International Museum and Art Center! Adding handprints to the mural going to France #paintforpeace @ Muramid Mural Museum. Finishing the evening with Carols led by strolling songstresses Tiny Tim's Aunties @ Muramid Mural Museum. Below are the venues that participated in First Friday: Oceanside Art Walk for December 2015 - What the Dickens, in partnership with Talento Hispano. Painting for Peace - participate in painting murals that will be given to local groups by American Embassies in countries struck by tragedy over the past few weeks, From Oceanside with Love: mural for Russia, led by Ed Coonce, in association with Art Miles Mural Project! Other murals for Paris, led by Beatriz Hidalgo, and Beirut, led by Lina Abi-Samra, will be painted at the Muramid International Mural Museum and Art Center in Artist Alley. Painting for Peace - participate in painting murals that will be given to local groups by American Embassies in countries struck by tragedy over the past few weeks, From Oceanside with Love : murals for Paris, led by Beatriz Hidalgo, and Beirut, led by Lina Abi-Samra, in association with Art Miles Mural Project! Additional mural for Russia, led by Ed Coonce, will be painted at Studio 219 at 219 N Coast Hwy. Lots to choose from @ RW! Thank you to our major sponsor, Mossy BMW of Vista! 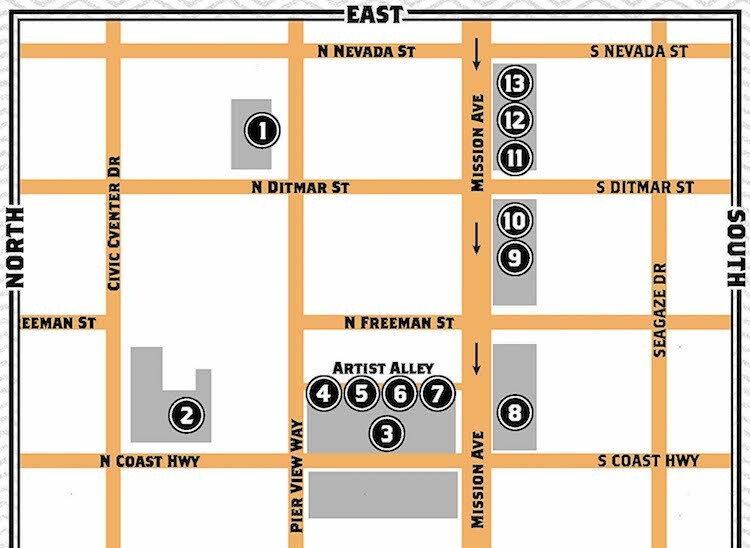 Below are the venues that participated in First Friday: Oceanside Art Walk of November 2015 - Feast. - Keep Calm Relax & Color - unwind and color! Magpie - an amazing blues/folk-rock tour de force! explore the *NEW* Mural Museum in association with Art Miles Mural Project! Below are the venues that participated in First Friday: Oceanside Art Walk of October 2015 - Falling for Oceanside Art Walk. - participate in The Big Draw! - See and experience the magic of tintypes: Rizzhel Mae Javier and Alejandro Arreguin Villegas bring the wet plate process and field darkrooms! - Bob Radio and FM94/9 San Diego posted up at the shop until 8pm giving away concert tickets! Below are the venues that participated in First Friday: Oceanside Art Walk for our First International Art Walk in September 2015 - Po-a-Trees-in-Motion. Here are the venues that participated in First Friday: Oceanside Art Walk for August 2015 – ARTiversary. Wesley White @ Banana Dang! Here are the venues that participated in First Friday: Oceanside Art Walk for July 2015 - Grafs, Tats and Toons. Kyla Moya @ Banana Dang! Here are the venues that participated in First Friday: Oceanside Art Walk for June 2015 - Ode to Oceanside. Artist-In-Residence Yui Inoue of Shiga, Japan invites you to join her wire knitting project, Story of the Clouds! 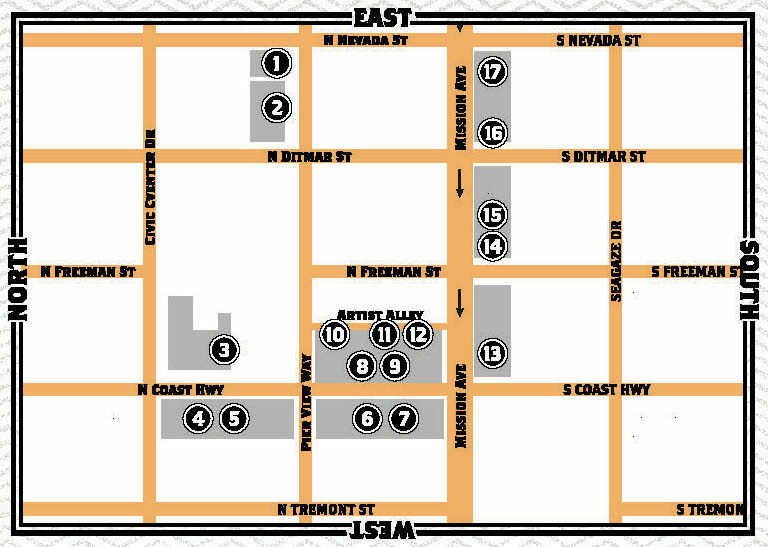 get stickers on your map from all venues and bring the completed map here for a free 'Support Your Local Artist' hat! Here are the venues participating in First Friday: Oceanside Art Walk for May 2015 - Black, White and Read. Here are the venues participating in First Friday: Oceanside Art Walk for April 2015 - Listen to the Music of the Art.